One of the most delightful aspects of superhero comics is the idea of multiple universes that provide infinite variations of established characters, allowing creators to think outside the box as they put new spins on old ideas. Marvel’s Exiles embraces the multiverse in ways few other comics have, building its entire concept around a team of heroes that travels through these different dimensions. The current volume of Exiles has taken the series to new heights thanks to the exceptional work of writer Saladin Ahmed, artist Javier Rodríguez, inker Álvaro López, colorist Muntsa Vicente, and letterer Joe Caramagna, who have all had the opportunity to showcase the depth of their talent as they take readers to undiscovered realms of the Marvel multiverse. Whether it’s an Atlantean hippie commune or a superhero world inspired by One Thousand and One Nights, each new locale has brought intriguing new characters and glorious visual wonders, all tied together by a story about a group of people fighting against authority to make lasting positive changes to all of reality. This exclusive preview of next week’s Exiles #12, the series’ final issue, kicks off the last standoff between Blink’s team and the Watchers trying to stop them, reinforcing the extremely high stakes doubling down on Kirby-esque design elements. 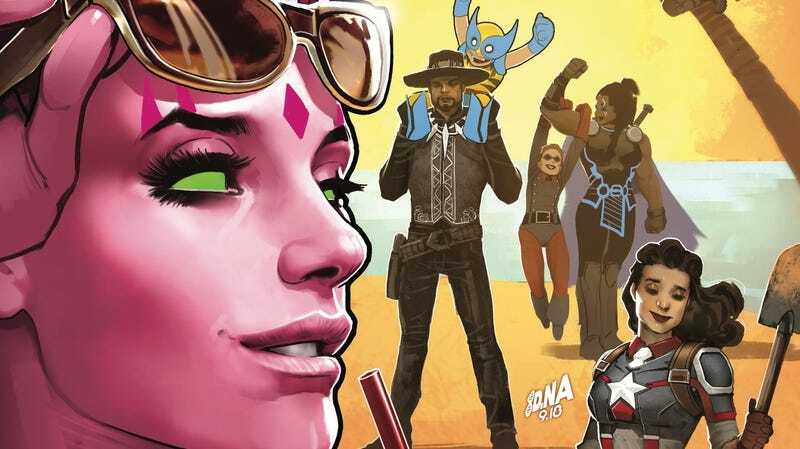 Rodríguez and López have been one of the strongest art teams in superhero comics for years now, and Exiles has been a fantastic showcase of their creative chemistry as they experiment with panel composition, page layouts, and different rendering styles. The addition of Vicente has further elevated the visuals with bold color choices, and her use of vibrant magenta in these pages separates the Exiles from the dreary blue-gray that surrounds their big-headed oppressors. The final page highlights how the art team’s innovative perspective enriches Ahmed’s scripts, and as the Watchers pull the individual heroes to different timelines, panels fly through a three-dimensional space like shards of glass. It’s sad to see Exiles go considering just how engaging this series has been over the past year, but given Ahmed’s growing profile at Marvel, hopefully this isn’t the last we’ve seen of these interdimensional heroes.